Marjorie Bruce may have been a princess, but her short life was marred by tragedy from her birth. Marjorie, who would become the founder of the Stewart dynasty, was the only child of King Robert I the Bruce and his first wife, Isabella of Mar. Her mother died shortly after her birth, which probably occurred in December 1296. We don’t know what happened to her, how she was raised, or who took care of her upbringing. Her father Bruce was busy fighting to free his beloved Scotland from English rule and could visit her only occasionally. When Marjorie was 6, Bruce was at the English court where he met his second wife, Elizabeth de Burgh. Elizabeth was the daughter of one of Edward I’s of England staunchest supporters, Richard, 2nd Earl of Ulster. It’s not know why Bruce decided to marry her. Maybe Edward chose his bride for him. Or maybe Bruce had once again switched alliagiances for political gain. Whatever the reason, the couple was married in 1302. Four years later, Robert de Bruce and his wife were crowned King and Queen of Scroland. But that doesn’t mean that his throne was safe. The English were still fighting and, just three months after the coronation, Robert the Bruce suffered a defeat. So, at the end of June 1306, Robert had to make the painful decision of sending his wife, his daughter, and his sisters Mary and Christina away for their safety. The royal party, escorted by Robert’s brother Niall and the Earl of Atholl, quickly reached Kildrummy’s Castle, which they had, however, soon to abandon when the English sent troops to cature them. Although the castle surrendered, the royal ladies managed to escape. They now made their way to the Orkney Islands, but never reached them. Along the way, the stopped at the small chapel of St. Duthac’s at Tain in Ross-shire, where they took sanctuary. But the Earl of Ross, one of Bruce’s enemies, didn’t hesitate to violate it and took the ladies, and Niall, prisoners. Niall was hung, drawn and quartered, while the women were sent to the English King. Edward I was very harsh with them, especially Mary. The poor woman was imprisoned in a cage hung over the walls of Roxburgh Castle. The King intended to put Marjorie in a similar cage, and had already ordered its construction. But his advisors thought the punishment too cruel for a 12 year old girl and so Marjorie was sent to the Gilbertine nunnery at Watton, East Yorkshire, where she was kept in solitary confinement. Her aunt Christina was confined in a different Gilbertine nunnery, at Sixhills, Lincolnshire. Her stepmother Elizabeth, probably because she was the daughter of the King’s friend, was treated more kindly. She was kept at the Tower of London and other places and allowed to have servants. Bruce couldn’t do anything to save his family until June 1314, when, at the Battle of Bannockburn, he crushed the English troops, taking many hostages. Some of the most important prisoners could now be exchanged for his wife, daughter, and sisters. Finally, their imprisonement was over, and they all returned back home to Scotland. Marjorie was now old enough to be married. Walter Stewart, Bruce’s 6th Lord High Stewart, had distinguished himself during the battle, and, as a reward, he was given Marjorie’s hand in marriage. The ceremony took place in 1315. But their marriage was shortlived. The following year, a heavily pregnant Marjorie decided to go out riding. Sadly, she fell off her horse and went into premature labour. 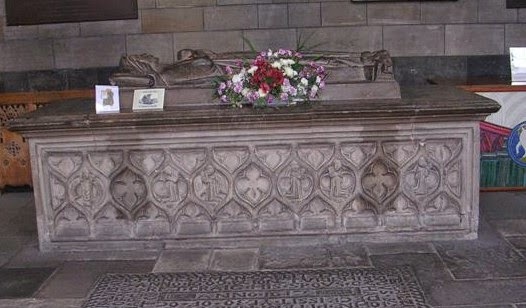 She was taken to Paisley Abbey, where her baby, who was named Robert, had to be delivered by Caesarian section. Marjoried died a few hours later. She was only 19. Her child Robert would, however, live to become the first King of the Stewart dynasty, Robert II.